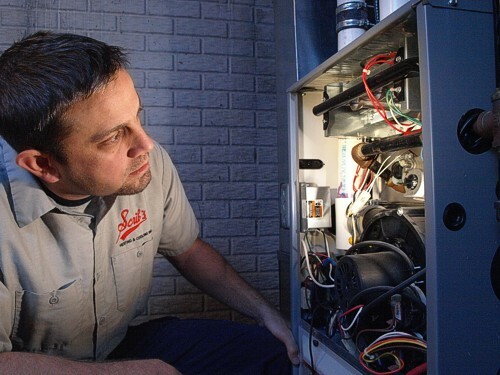 At Scrib’s Heating and Air Conditioning, we take great pride in our residential division. All of our customers are treated to fast, reliable service, and to quality installation in their homes. We pride ourselves on our honesty when it comes to repairs. All of our repairs are on flat rate pricing: You know the cost of the repair before it’s done! Scrib’s has built a reputation on referrals. No fancy advertisements just a lot of integrity, trust, and hard work to be the best. Our installation department is second to none. An independent study was done by The North Carolina Energy Corporation on the quality of installations. The results were staggering: 90% of all the units inspected exhibited some sort of energy-wasting, comfort-robbing problem. Duct leakage, oversizing, and incorrect refrigerant amounts were just some of the problems found. Don’t worry, with a Scrib’s installation you will be in the top 10%. Our exclusive 33-point check list will ensure that your installation is done right.